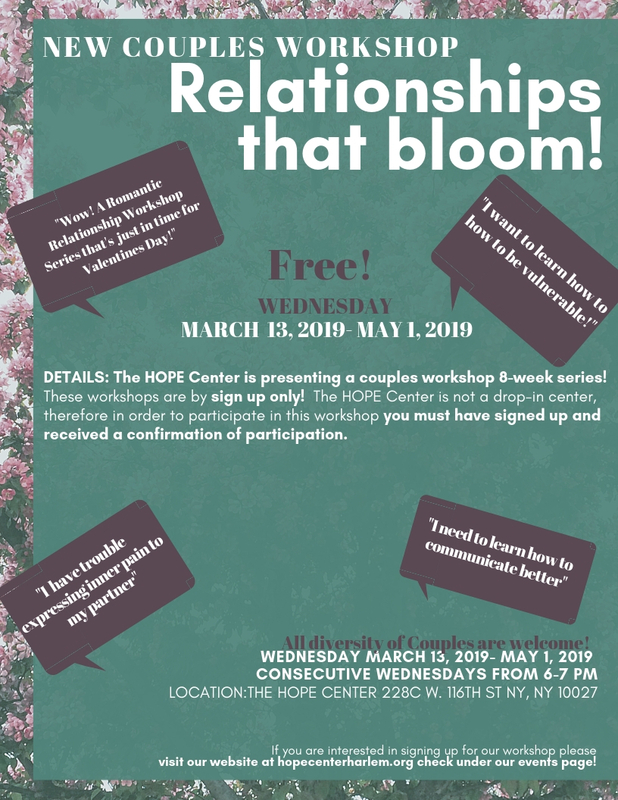 DETAILS: The HOPE Center is presenting a couples workshop 8-week series! This is going to be a great workshop that will include other couples. Groups are a great way to learn more information in a smaller amount of time! This is a wonderful opportunity to gain more experiences and understanding in a room with a wealth full of knowledge. There will be weekly assignments and plenty of opportunities to grow in your relationships! These groups are diverse and will include different ages and types of couples. This diversity will strengthen the experience! See you all there! These workshops are by sign up only! The HOPE Center is not a drop-in center, therefore in order to participate in this workshop you must have signed up and received a confirmation of participation. The sessions begin on March 13, 2019 – May 1, 2019. You must sign up to participate! Please visit this link to learn more!